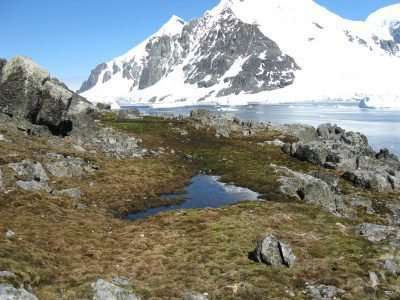 BAS ecologist and lead author Dr Kevin Newsham said: "This was an unexpected finding, showing carbon that had originally been fixed from the atmosphere from as far back as around 800 AD is stored in soil under grasses on the Antarctic Peninsula. We know that processes are very slow in the cold environment of Antarctica, but carbon could be stored in undecomposed organic matter of Antarctic soils for much longer than we previously thought. "This is important if we want to understand which carbon fractions are released into the atmosphere as temperatures rise in polar regions." It is predicted that a significant amount of carbon will be respired from thawed layers of permafrost by soil microbes as the Earth's climate warms (and more so in the Arctic, where there is far more soil and peat than in the Antarctic), and so determining the decomposition processes influencing its release to the atmosphere is pivotal to understanding the carbon cycle and impacts on the biosphere. You mean the fungi are in on it as well ! Yeah we are fucked! Now that the fungi are in cahoots with those unscrupulous money hungry scientists, the rest of the ecosystem is sure to follow. Stupid life! Why is it it all against us? To their surprise, the scientists found that some of the carbon was about 1,200 years old. Well, that is a huge surprising! And I thought that carbon was forged in stars billions of years ago via stellar nuceosythesis thus that carbon is BILLIONS of years old, not merely 1,200 years old! I wish they wouldn't make such badly thought out confusing assertions without any consideration of how the reader might misinterpret them. Please be unambiguous.